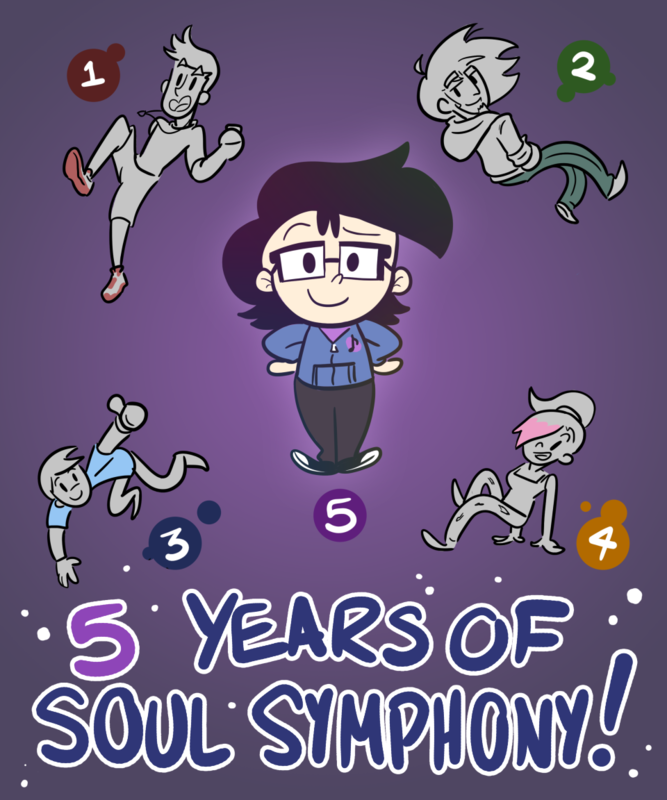 Soul Symphony is now 5 years old! Or, at least, will be on Sunday, haha. I’m as speechless as I am every year, but 5 seems weirdly monumental. I never would’ve imagined I could’ve stuck to a comic for so long. Before this, I used to start and stop comics all the time. My record for pages was 51, but many of my “series” only lasted like 3 pages before I gave up. I owe my motivation not only to my passion in Soul Symphony itself but also to your interest. The fact that anyone reads at all is flattering. The fact that people enjoy it is incredible. There are so many people to specifically thank, but I’ll do that when the series is over. Until then, thank you so much for reading! Anyone have a favorite page or moment? I think we all know mine is this. To another five great years… which mean you’ll have to stretch this final movement a bit longer. Congrats on hitting half a decade! I’ve really enjoyed reading this comic for about two and half years now, and I’m still so excited to see how the story wraps up. Here’s to the rest of an amazing run! It captures my feelings on high school band and the importance of music education in general perfectly. It really shows what a difference it makes. Thank you! I’m so happy that that page resonated. Sometimes I never know if those kind of moments are going to make sense or if anyone’s going to be able to relate to them besides me. Music education [and the arts in general] are so important in school, and I learned so so much more from band than just pitches and rhythms.